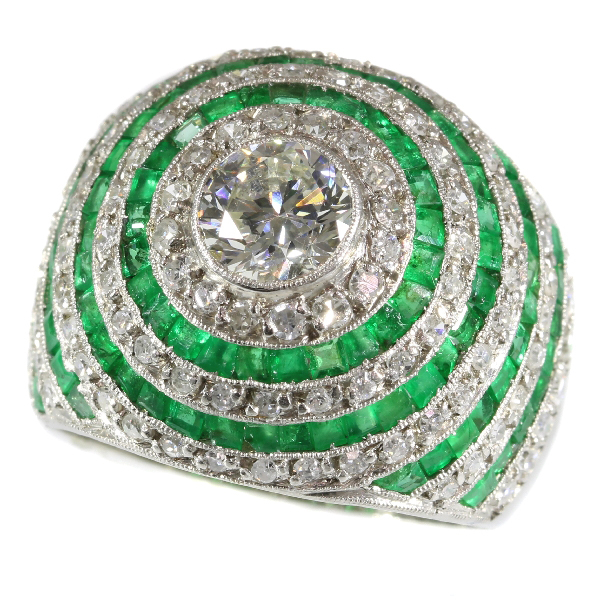 Magnificent diamond and emerald platinum Art Deco ring: Description by Adin Antique Jewelry. This platina Art Deco ring radiates pure white shimmer and verdant green beams from its 0.75 ct diamond center in five expanding circles of a total of 104 diamonds alternating with four circles of 96 emeralds in total. How extravagant this jewel presents itself through its design, so meticulously it is crafted too. The attention that has been spent on detail and perfection for every à jour cut gem setting is extraordinary. One could wear this ring inside out just as well, so to speak. Last but not least, the creation of this piece of virtuosity could have risen in the twenties as well as up until the fifties of the 19th century. Its refined mastery and use of coloured gemstone patterns points us to Art Deco, but its grandeur and more modern cut central diamond leads us to a later period. No explanation necessary to see that ring is ageless in any case. Diamond(s): One brilliant cut diamond with an estimated weight of ± 0.75ct. (colour and clarity: I/J, si/i). 104 single brilliant cut diamonds (also called 8/8) with an estimated weight of ± 1.00ct. (colour and clarity: I/K, si/i). Total diamond count: 105 pcs. Total diamond weight: approx. 1.75 crt. Precious stones: 96 emeralds . We did not check if the emeralds are lab produced or not as this information has no influence on the value of this jewel. Natural emeralds and lab produced emeralds were both used in this era, rather more for their effect than for their intrinsic value.